There was a time when I really believed it was still possible to keep oversight over my music collection, even though by then I had already lost it. I think it ended when I began buying extra cassette recorders, so that I could dub tapes for trading music without having to listen it. I would rather listen to all the new vinyl and CD’s that I bought and which was already too much for the time I had to listen to them. Then came CDr’s, and I should have known by then that I was fighting a lost battle. Maybe I knew it in the back of my mind, but I refused to admit defeat. Even when mp3 CD’s became the standard for trading music, I somehow had periods in which I believed that, with a little extra effort, I could regain complete oversight over all the music that entered my home. I wanted to know where every song is (on what record, tape, CD or whatever). But while writing this blog the inevitable truth began to dawn on me: it will never work. There is too much music! Today I spend a few hours searching for some tapes with music that I had recorded from the radio twenty years ago, in search of a song by a guy who played a chainsaw. I found so many other great tapes that I have spend all day listening to these tapes. I have not found the tape that I was originally looking for, but I did find a tape with live recordings from The Gangbusters. I imagine that some of you would rather hear about the guy with the chainsaw, but that will have to wait for another time. 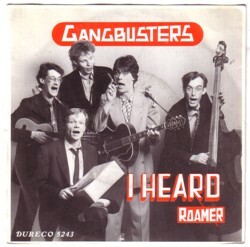 The Gangbusters were originally a trio with Gert-Jan Blom on slap-bass, Frank van Meeteren on guitar and Ton van Bergeijk on tipple( a small guitar), but later they played with saxophonists (*Roland Brunt* and Boris van der Lek) and a tapdancer named Peter Kuit. They played covers of jive songs, which no other band in Holland did in those days. And they did it very well. I have seen them on stage many times and the two LP’s they made are still played every now and then. Especially Gert-Jan Blom* became a famous musician in many other bands, orchestra’s and projects. Like the re-creation of the Laurel&Hardy music, which he did with Piet Schreuders, one of the most amazing musical projects ever, which I would love to elaborate on here, if our kids were not coming home from school within half an hour. 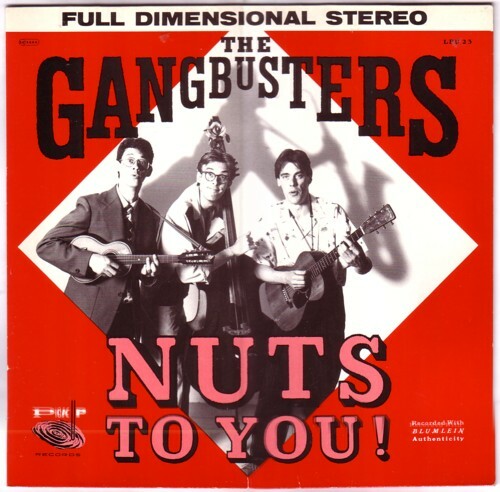 So for today all you get is a song that The Gangbusters played for a Dutch radio show in the mid-eighties: Eight, nine and ten. It is definitely not their best recording, but is a song that never appeared on their records. i guess you will have to try e-bay to get that single. But i will ask around. Please send me an e-mail adress; my mail-adress is at the home page.